Long before the Air Force 1 and Nike Airs dominated the trainers market there was a pair of running shoes that were kings of the street for Nike – The Waffle. Nike co-founder Bill Bowerman created the first pair by pouring rubber into his wife’s waffle iron, thus creating the basis for the pattern on the sole. The wedged heel, the cushioned mid-sole, and nylon uppers (to ensure they were lighter than leather rivals) followed and down the side was added the (soon to be) iconic swoosh. The swoosh, however, was not his design. It was created in 1971 by Carolyn Davidson, a Portland State University graphic designer and she was paid a one-off fee of $35. Years later she received stocks in the company, we presume out of guilt. Bowerman sensibly decided against his original idea for their name (the nipplesole) and they entered the market and were worn by top runners of the day – despite being such a basic shoe. Nike marketed by saying that four of the top seven runners at the 1972 Olympic Trials wore its shoes and in 1974 the general public were buying them up spured on by the jogging boom that was sweeping America at the time. ‘If you have a body, you’re an athlete,’ Bowerman said at the time. A second, slightly improved, version was launched a year later and in 1977 The Lady Waffle Trainer hit the stores. Technological advances in trainer technology meant that athletes upgraded to the advanced shoes and the Waffles fell out of style and eventually became the sole preserve of collectors and sneaker freaks across the world, but they were never forgotten. Eventually in 2002, after demand from the public, they were re-released with the same 70s-grade nylon. 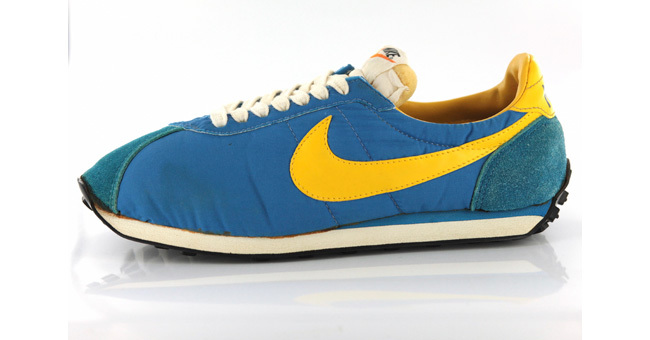 They’re available in several colourways but the bright blue with the yellow swoosh are the most famous and the best. They’re the shoe that made Nike famous and 37 years on, they still look fresh.